When the Nintendo Wii and the Wii Remote were unveiled, a lot of sporty gamers thought of one thing: Wii Cricket. 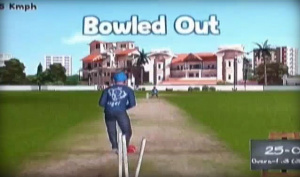 Unfortunately, despite online petitions and campaigns in the system's early years, the perfect cricket experience on the console hasn't been forthcoming, even with the addition of MotionPlus in summer 2009. Even the highly coveted Ashes Cricket 2009 only managed to score a 6/10 from our review staff, and practically the only other option is a section of THQ's 2008 release Big Beach Sports. Developer Gameshastra now tries to step into the breach with Cricket Challenge, but does this hit the bowler for six or get its stumps knocked over? 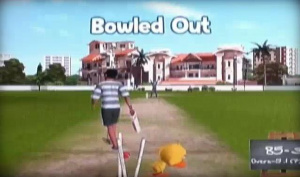 The marketing for this release, which casts you as a crew of local teenagers in India, makes reference to this being an arcade sports game where you play as a batsman in a "street" version of cricket. The advertised idea sounds appealing as street cricket is a big deal in that country and has even been the subject matter for major TV advertisements. However, when you fire the game up, you will notice one thing right away – you’re not playing street cricket. You are playing on a real wicket in a big grass area. The only "street" elements are apartment buildings in the distance and the sounds of car horns. This game is not, by any stretch of the imagination, a representation of playing cricket in the streets. You do play as kids in shorts and t-shirts with only a bat and ball between them, but that’s where the comparison ends. A missed opportunity, in our view, given the concept. The main question asked of any cricket title on the Wii is, of course, whether you actually feel like you’re wielding a bat made of the finest willow. 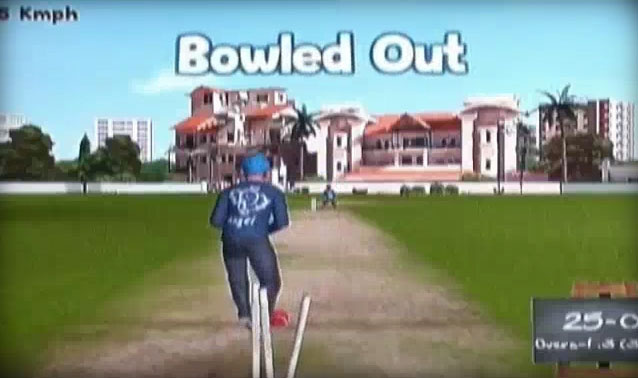 Sadly, MotionPlus is not utilised in Cricket Challenge, and what is more disappointing is that this title even fails to employ the capabilities of the standard Wii Remote. The device on its own may not have 1:1 precision, but is capable of solid results in casual sports games; Wii Sports is a perfect example of this. Cricket Challenge fails in this area, and considering that the game is played solely by swinging the Remote, with no buttons used at all, this is a major problem. The instructions inform you that you should hold the Remote like a bat and that your swing will determine the direction and power of your shot. In our experience, this is not the case. We found the controlling the direction of our shots relatively unpredictable, though at times the batsman played the expected shot. After plenty of playtime you may conclude, like us, that these occasions are pure coincidence. The batsman seems to auto-select your shot based on where the delivery is going, and at times this choice is baffling, putting precious wickets at risk. In controlling the power of your shot, how hard you swing the Remote has little impact. It appears that the game picks up a single movement of the accelerometer and produces an automated swing, rather than tracking speed or motion in any substantial way. A basic waggle replaces a button press, and the problem is exacerbated by a poor sense of timing and reaction in your batsman’s swing animation. Notably, we had better luck sitting down and waggling with our wrist than standing up and swinging with our Wii-bat, as the game calls it. The controls, ultimately, are a big let-down. 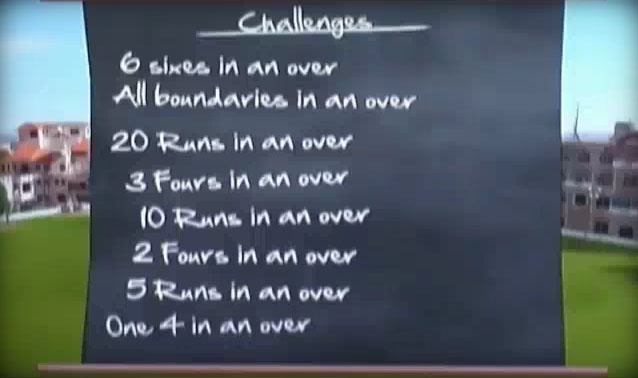 In terms of gameplay options in Cricket Challenge, you will immediately notice that there aren’t many. You are only allowed to bat, with no bowling or fielding included. This is also a one-player experience, so you can’t take on your friends in direct competition. The lack of variety continues in the three game modes, It’s your turn, Can you bat? and Nail biting finish. The first mode is for practice; you determine how many overs and what kind of bowling to face. In Can you bat? you start off with two overs, eight challenges and eight wickets at your disposal. You can only beat one challenge per over, which adds an additional over to your total, so you have ten overs to beat all eight challenges. What is the issue with this? It’s impossible. Some of the challenges are easy, but the last two are ridiculously difficult; your task is to score boundaries from every ball in the over and score six sixes in the over. 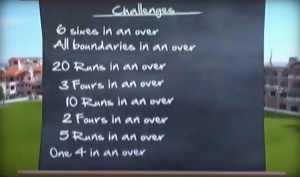 36 run overs are extremely rare in cricket, and the infuriating thing is that the third game mode can only be unlocked by beating all of these challenges, depriving you of one third of the very limited content on offer. Due to the controls in this game it would honestly be easier to beat these challenges in real life, with a stick of rhubarb in place of a bat. These issues are compounded by the overall presentation of this title. The graphics wouldn’t look out of place on the N64; chunky character models are the order of the day. The animation and AI of the fielders is glitchy and they seem to have no idea where the ball is until it’s past them. It moves along the grass like a puck on an ice rink, and when you are caught by a fielder they have a unique ability to transport themselves to the ball in a single frame of animation. If these kids can do that, they’re definitely destined for greatness in the international game. The audio rounds things off with two or three looping sounds of whooping and calls of "Come on, boys!" from a mystery man who is nowhere to be seen – either that or these players' voices have matured way ahead of time. The Wii is a console that should have an enjoyable cricket game, but this isn’t it. It may only be 500 Nintendo Points, but there are problems with buggy and lazy controls, lack of variety, impossible difficulty, decade old graphics and unimaginative sound. You may occasionally have success waggling your way to a whopping hit for six runs, but the game quickly becomes tedious and frustrating. We feel your pain, cricket fans, but don’t let your pining for Wii Cricket force you into buying this game. This is about as authentic and enjoyable a cricket experience as hitting a ping pong ball with a cardboard tube, not to mention less fun. Damn, it could have been great. Probably rushed it out to coincide with the world cup. Speaking of, you Pommies are getting smashed by the Netherlands lol! I was predicting that it would get a 3/10 and I was right. After reading that review, I didn't think it would even get a 3. There's international cricket?! To quote a certain mutant turtle, "You've gotta know what a crumpet is to understand cricket." I'll wait for the next World Baseball Classic while hoping we eventually get a good WiiWare baseball game. @Zaphod - thanks for posting some info about cricket available in the US. The Cricket World Cup started a few days ago, it's being hosted in Bangladesh, India and Sri Lanka. Cricket isn't purely an English thing, in fact England nearly lost to Holland in their opening match! It's one of those sports that takes a while to pick up (a bit like NFL football for those outside the US), but once you get the hang of it you may get hooked. Aw... it's not so good. Well, back to supporting the West Indies for the Cricket World Cup! Not surprised this didn't turn out so well. Cricket 2010 on the PS3 is a good one, so I'll stick with that for now. Also, the cricket world cup Is awesome. I understand Cricket about as well as I do any sport, which is to say "not at all". Still, I've always found it to be more interesting than most sports. Shame there's so few decent games based around it. the last paragraph made me laugh.